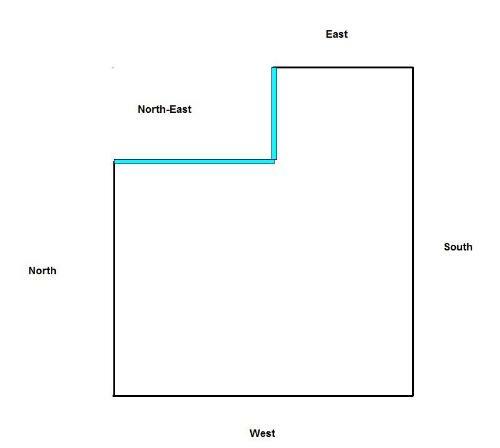 Northeast is the most important Direction of the house. It's associated with our income and progress. So of a property is cut in Northeast Direction then it has direct effect on our progress and income thereby effecting our social status. At times while buying a property Vastu is not taken into account. If such type of property has been bought then it's bad effects will also be seen. A person with little Vastu knowledge or an expert will never let purchase of such a property. But unluckily if someone has bought such property then these remedies should be followed which are very powerful. *make a gate or window in Northeast. *on North or East wall put 12*24 mirror. *avoid blue and red color in this direction. *hang a crystal ball 30mm on the window in this direction. *never keep heavy articles in this area. *place a fountain which is small in size.